14 Agosto 2018 – W.A.P. The Snipe island 54 ° 57′ South, 67 ° 9′ West was involved into a military incident that took place between Chile and Argentina during 1958 as a result of a disputed border line in the Beagle Channel for the possession of that islet. Snipe Island, located a mile from Navarino, is a small rocky formation with sparse vegetation that was occupied by an indigenous Yahgan from that island, authorized by Chile to graze sheep in it. On January 12, 1958, the Micalvi cutter of the Chilean Navy, based in Punta Arenas, built a blind beacon on the Snipe island, on the Beagle Channel, as an aid to navigation and on May 1 of the same year, the Patrolman Lientur was commissioned to install a luminous beacon on its structure, giving the corresponding international warning to alert sailors to its existence. 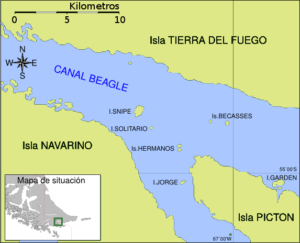 The fate of Snipe islet has since been settled by the Treaty of Peace and Friendship of 1984, as an internationally recognized territory of the state of Chile. There is now a lighthouse (WAP CHL-LH-NEW) on the islet. The Treaty of Peace and Friendship of 1984 between Chile and Argentina was signed into agreement at the Vatican on 29 November 1984. Actually, on this sub-Antarctic site there is a Navy outpost, a Meterological Station and a Lighthouse. 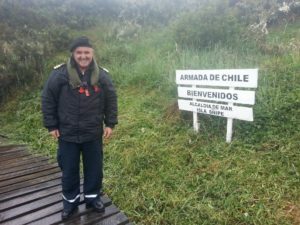 Who knows if one day, some willing Radio operator or one of the Chilean Radio Clubs will try to activate this rare DX spot … ee would be happy and proud to Log a DXpedition from Snipe Island!